The Brick Castle: Happy Christmas 2015 from Stick Man (Children's Story by Julia Donaldson and Axel Scheffler). Happy Christmas 2015 from Stick Man (Children's Story by Julia Donaldson and Axel Scheffler). 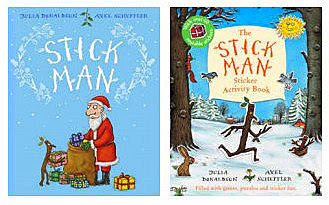 Stick Man is written and illustrated by Julia Donaldson and Axel Scheffler. They are a prolific pairing who have created over 20 of our best loved children's books together, including The Gruffalo, Zog, Room On The Broom and The Snail & The Whale. Stick Man is exactly as old as my 7 year old and it really is a top 5 favourite book in our house. I was delighted to discover that this year Magic Light Pictures have created an animated film version to be the big BBC TV children's Christmas Story Of 2015. Previous Christmas animated stories by Oscar-nominated film producers Magic Light Pictures have been beautifully done, including The Gruffalo starring James Corden and The Gruffalo's Child starring Shirley Henderson. 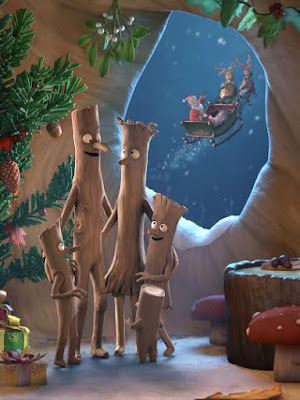 Stick Man will star the voice talents of Martin Freeman, Hugh Bonneville, Jennifer Saunders, Russell Tovey, Rob Brydon and Sally Hawkins. 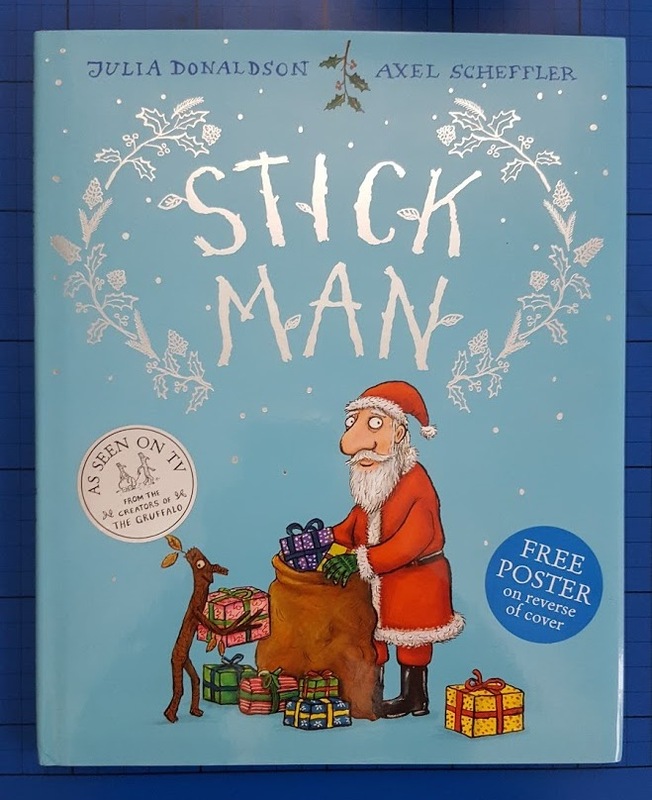 If you haven't yet read Stick Man, it is a festive story book and Christmas is important to the plot. A sad tale in parts, but it's a children's story and it ends well. Written mainly in rhyming couplets, it's memorable and repetitive, so it is a lovely book for younger children to 'read along' with you, before they can actually read the words written on the page. 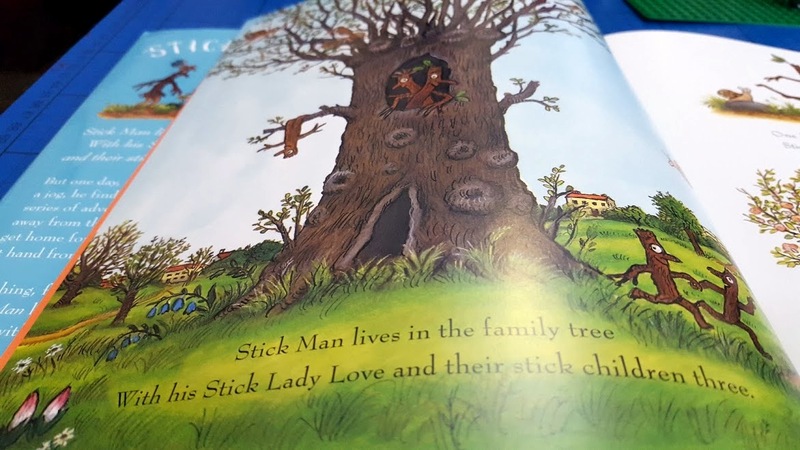 Stick Man is going about his everyday life when he isaccidentally mistaken for a plain old stick, and finds himself on a string of adventures, meeting lots of different characters as he tries to find his way home. He even meets up with, and has a helping hand from, Santa Claus himself. Stick Man is a story about helping strangers, but it's mainly about family and home and all that it means to us personally. It is perfect for Christmas time and embodies the true spirit of Christmas for me. Suitable for anyone over around 18 months, I love to read this book snuggled with my children, and it's remained a firm favourite throughout the last 5 years or so. 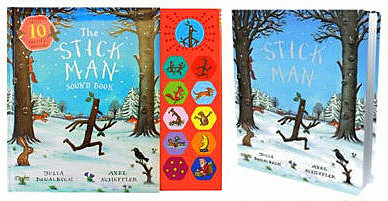 We were sent a new hardback gift edition Stick Man book to review, with a great reversible poster cover. The gift edition is A4 sized, beautifully made with extra illustrations on the cover and glossy inside pages with nice bright images. The illustration is sensitive and full of animation, and the words are thoughtful and teach children (and some adults) empathy. The poster is a gorgeous bonus, although I'm loathe to actually put it on the wall! To find out more about Julia Donaldson and Axel Scheffler and all of the characters they have co-created, as well as Julia's other work, visit the Julia Donaldson website. If you fancy the outdoors this Winter then Stick Man Trails are coming to Forestry Commission sites all over the UK from December - find out more on the Forestry Commission website. This is one of our favourite Julia Donaldson books, too, and I am so looking forward to the Christmas show - I am, let alone the kids! :D you and me both. Never mind the children, it'll be me sat on the sofa ready! We're going to see Stick Man on stage this weekend - and I'm VERY excited about this film adaptation. I'm sure my children will love it. Oh, yes, the poster is a fabulous bonus to go with a fabulous book. Thanks for the review. This is also one of our favourites, such a lovely book. We're really pleased that Stickman will be the latest Forestry Commission trail too - so apt. A perfect book to give to any young child.